Syriac SwipeKeys keyboard - a full custom keyboard help you save your Syriac language, type it fast same as English keyboard. *How to use? please watch the video tutorial from main app and follow it. 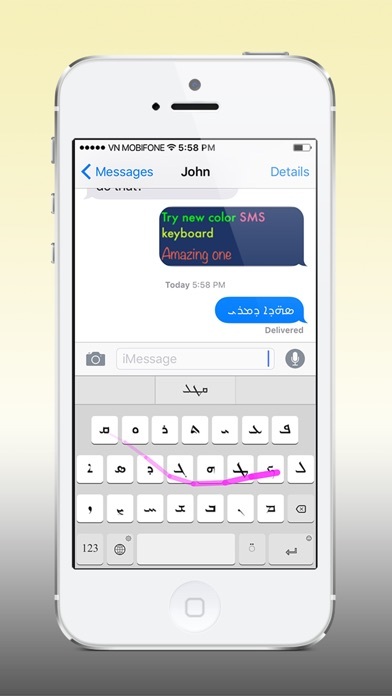 ------How great is Syriac SwipeKeys?---- ----------------------------------------------- ***** by Ashor05 - Version - 1.0 - Sep 21, 2015 Sehr gute App, richtig geil Great app ***** by Lamasoo - Version - 1.0 - Sep 20, 2015 Really great app Belle87 ***** by Sausasa - Version - 1.0 - Sep 20, 2015 I waited for this app for A long time thank you guys for making this possible it works amazing!!! Love that font ***** by Marko hani - Version - 1.0 - Sep 20, 2015 It works perfect, thank you very much. ܒܲܣܡܵܐ ܓܵܢܘ̇ܚܘ̇ܢ ܐܲܠ ܕܵܗܵܐ ܐܵܦܦ. ܪܵܒܵܐ ܣܘ̇ܕܲܢܬܝܹܠܵܐ. God bless you. Excellent job. I'm so happy to have a keyboard of my language. Love this app..... Thank you. The app is much needed to move us into the 21st century. It's nicely done and has awesome components like the predictive text and ability to switch between fonts. A few suggestions would be to incorporate the dollar, pound, and euro signs into the keyboard like other standard ones. It's a minute issue, but it'd improve the experience. Also, will Estrangel and Serto be reincorporated for use? When switching between keyboards on my phone, I've noticed that the Syriac one has "Arabic" written below it. Is there a reason for that?